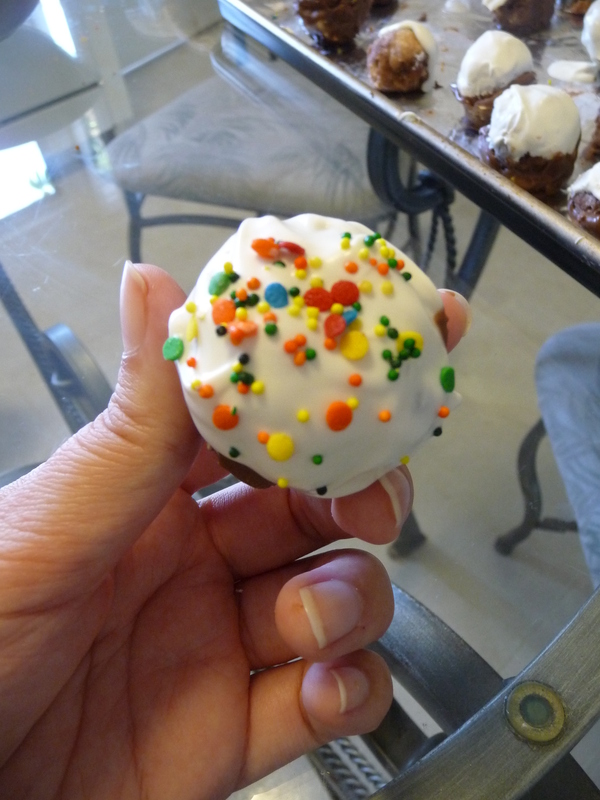 I had been wanting to make these Bakerella cupcake pops forever. Which, in Margaret time, is two months. 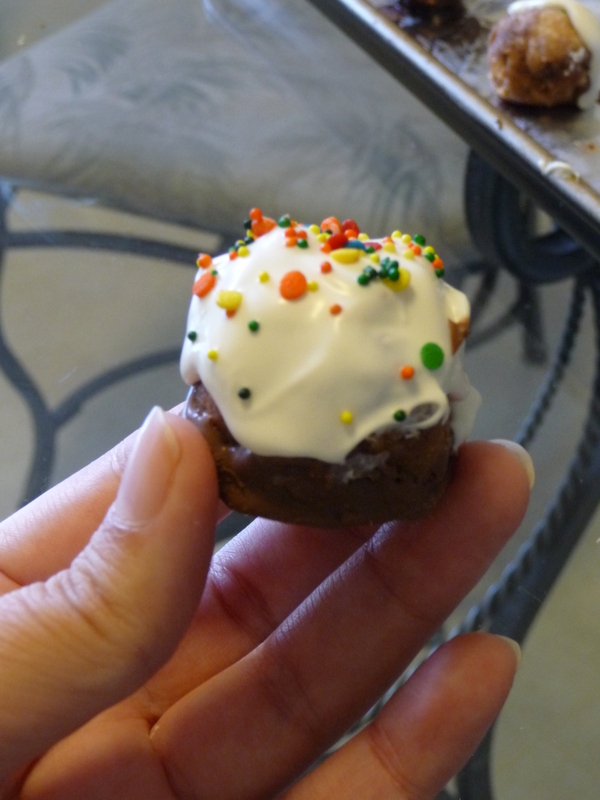 Basically you squish the cake in with the frosting, roll into little balls, freeze, then mold the bottoms into a cupcake shape using the flower cookie cutter. Freeze again, then dip into melted candy coating or chocolate. Yes, there are many steps, but darn it, Bakerella lady made it look so simple. Simple as taxes! Even Martha Stewart dipped hers quite easily. Oh yeah. I’m not Martha Stewart. I forgot again. Preparing for this task was a Herculean effort. First I had to find the mini flower cookie cutters. Nowhere I looked had them, until I found them at this shop in the mall called the Compleat Kitchen; and the nearest size was the 1.5 “, which is not the kind that works best. They had candy melts, too, but those looked like pioneers had brought them over, so I was going to use chocolate chips instead since the local grocery stores don’t carry the candy melts. Also, I don’t know if you know this, but I am dreadfully without a nearby craft store. There are no Michael’s craft stores or Joann’s or anything like that here. There is something called Benjamin Franklin’s, one in Kailua which is theoretically only about 6 or 8 miles but is like a 2-hour round trip, and one downtown (theoretically 10 miles but also 2 hours). Last October, I went to the Kailua store, saw that a foam Halloween craft house cost like $25, turned around, and never returned. The good thing about the Kailua store is it’s next to Round Table and Starbucks, so if it were cheaper that shopping center would be my Triumvirate of Pleasure. Sigh. Plus, I can always get my husband to drive me there because he loves Kailua beach. So I have this new friend named Leslie, who is the mom of Kaiya’s friend from preschool. 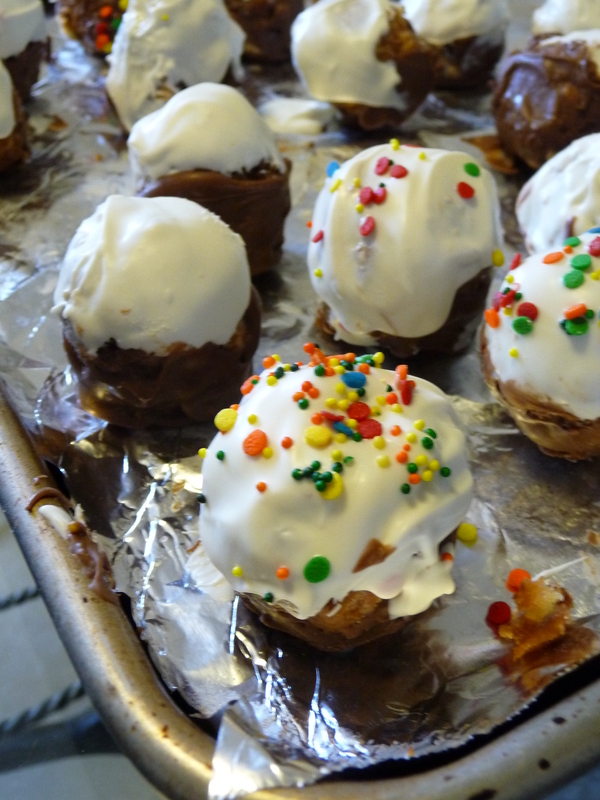 Leslie struck me as a craft-appreciating sort of person and by gum, my hunch was right, because it turns out she has an Etsy shop where she sells her handmade burp cloths, and had actually MADE these cupcake pops before. I invited Leslie over to have a cupcake pop making playdate. Oh, yeah. She brought her kid, too. Kaiya had quite the extravaganza of playing. For real. Watch the Martha video. Anyway, getting the balls to look like cupcakes is about a milli-yun times harder than it looks. Most did not resemble cupcakes so much as, at best, mushrooms; or at worst, elongated oval-like shapes, like cracked eggs. I did all the steps the day before Leslie came over and had the balls in the fridge, ready to dip. We tried to reshape some of them and I found the flower-shaped cookie cutter to be all squished; I think Cadillac dropped it down the Disposal and forgot to tell me. Hmm, I’ll have to ask him. 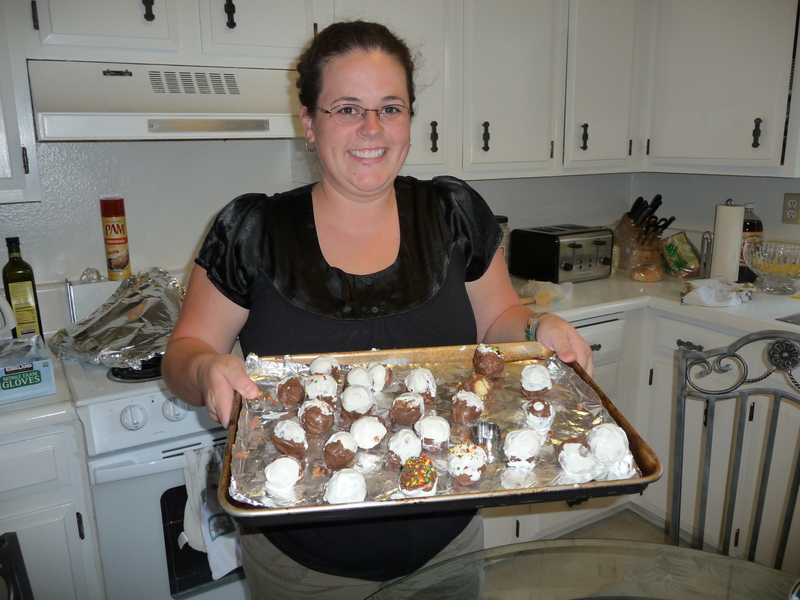 Leslie brought white and milk chocolate melts that harden upon drying. Then we glamorously began to dip the balls into the melted candy. No matter how hard we tried or how meticulous we attempted to be with the chocolate, nothing looked as good as Bakerella’s. The little girls came in, dipped, and ate the candy coatings off. Ethan and Elyse liked the cake mix, particularly Ethan, who I think ate around 6 before I realized the alarming rate at which he was downing them and had to put a stop to it. 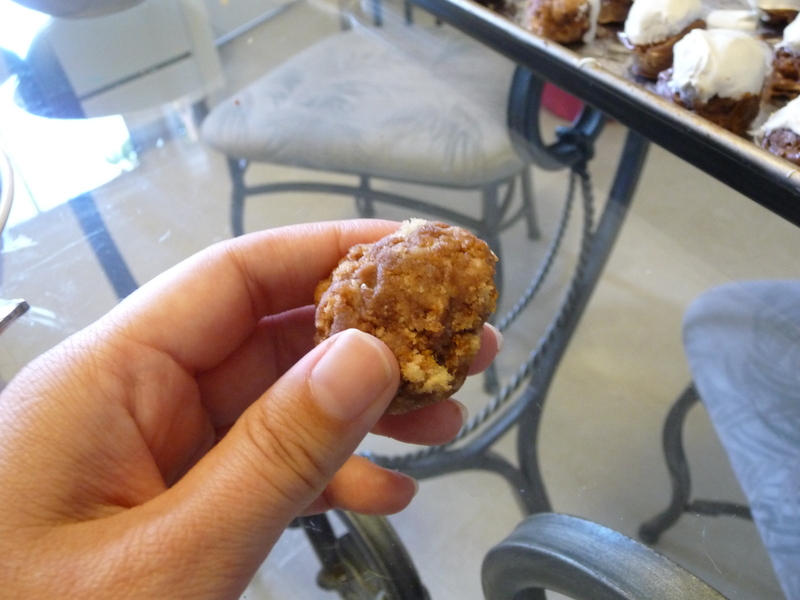 They taste like cake like bon bons. Meanwhile, Leslie and I dipped some more and talked about the gardeners, who take an entire day to remow a small swatch of lawn that was mowed only a few days before, and therefore short to begin with; and whose love of weed whackers and leaf blowers (useless in 35 mph winds) has surely rendered them deaf. I felt relieved that someone else noticed. It’s always nice when someone proves something is not all in your head. 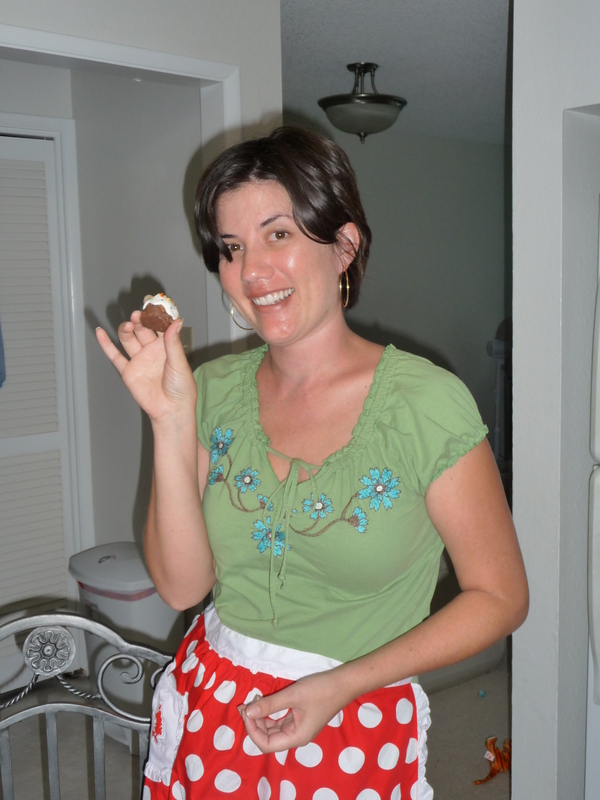 I, of course, wore my Minnie Mouse apron (thanks, Adriane!) for this laborious task. Oh, where are the POPS, you ask? The sticks? Skipped them. Leslie reported they didn’t work well when she tried them, plus I could not find any. Maybe next time. Wow. Those look delicious but maybe too much work for me. I would however offer to be a testing subject. I adore Compleat Kitchen. And yes… craft stores here are very pricey. Whenever family and friends travel to the States I have a list handy. In fact, my Sister in Law is coming home for the summer and she is bringing me toffee chips since stores don;t carry them here. Those are adorable and look delicious. Too labor intensive for me. But now if anyone ever give me one, I’ll know how hard they worked. WOW! That Leslie’s HOT! I wonder if she’s available!?! Too bad the whole family (meaning the parents) Re-re-started their diet the next day. So instead of gorging on pops, they were more like a farewell Amuse-bouche bonbon. Who cares about the sticks? And who cares what they look like when you’ve got frosting, cake, candy and chocolate. Are you kidding me? I see a project for my kids for Mother’s Day. Ha!